The platypus is a very interesting creature and in most parts of the world is quite an uncommon sight to see in everyday real life! What does it mean to dream of a platypus? A platypus can mean many things in our dreams. This animal is quite unique, and often times in a dream can mean to be flexible, true to yourself, and embrace your unique individuality. The platypus is a creature which has characteristics of multiple species - all as one animal! A platypus is a mammal, but also lays eggs and has webbed feet! As a native animal to Australia, these creatures are quite fascinating to learn about if you live somewhere else and have never seen one! 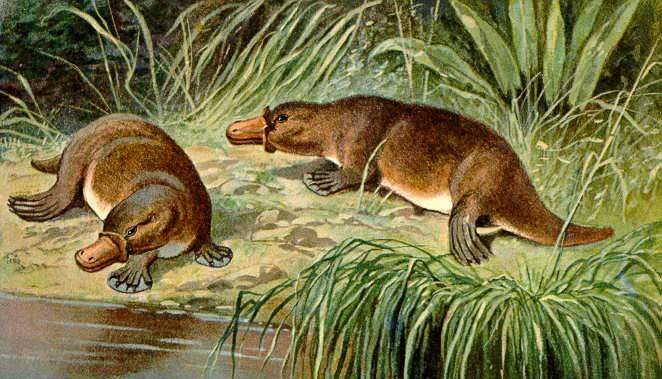 A platypus combines features of a number of different animals all in one. It has the tail of a beaver, the bill of a duck, the webbed feet of an otter, and the male platypus is even venomous like a snake or spider! What does this mean then when you dream about a platypus? It means that you are very adaptable to any situation that may come your way! You are prepared for whatever challenges you may face in life. It could mean that you have a lot of various responsibilities in life, but you also have the different skills required to successfully meet them! Paying attention to the characteristics of the other animals a platypus resembles can give you additional wisdom. For example, the tail of the beaver that is present with a platypus could be an indication that you are industrious and hard working. A platypus is a very unique animal - there are not many other types of animals like it in the world! This is a reminder to yourself to embrace your unique characteristics and strengths to create the life you want to live. Dreaming about a platypus can mean that you are worried about what others think. It is a message that you should do what you enjoy and can be of benefit to others without listening to the naysayers or doubters. To dream of a platypus could mean that you often feel introverted in large social settings. It may mean that you need to work on being more comfortable expressing yourself! A platypus is all about acceptance. Sometimes it requires radical acceptance to be ourselves and who we are in life. Knowing that you are able to accept reality for what it is and get through it is a very desirable characteristic to have! A platypus may also appear as a power animal to support you in learning to love yourself for who you really are - flaws and all. Sometimes, what appears as a flaw or something negative to others actually can give you an advantage in life. The Platypus is a solitary animal - and so often times it can mean that it is important for you to take some time away from others to reflect and recharge. A dream about a platypus could also indicate you are a very independent person. You do your own thing and forge your own path in life. You may not fit easily in with the rest of the world's expectations. You may be very innovative and creative in your work or personal life. These characteristics can help you be a very important leader. You may introduce others to new concepts and ideas or a different way of looking at things in life. Did you have a dream about a platypus? Is the platypus your spirit animal guide? Share your thoughts and experiences in the comments section below!